Cadee was born and raised in the Sydney suburbs, graduating from Westfields in 2008 where he has been named in the school's Hall of Fame. He began playing for the Bankstown Bruins in the Waratah League, named the Australian Under-21 Youth Player of the Year and in the All-Star Five before earning a scholarship at the AIS where he competed for them in SEABL. Cadee also played for the Australian Emus at the 2009 FIBA Under-19 World Championship where he averaged 9.1 points, 2.3 rebounds and 1.9 assists per game. On 17 December 2010, Cadee made his long-awaited debut for the Blaze after recovering from a car accident, scoring 11 points in his first game before signing with the Adelaide 36ers in 2012 where he featured in the Grand Final two years later. He then made the move to the Sydney Kings and has become a permanent fixture of the team while also enjoying stints with the Super City Rangers in the NZNBL and Kymis in the Greek Basketball League. 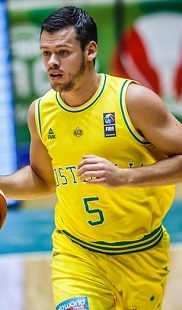 In terms of Boomers appearances, Cadee was named to the national team for the 2012 Stankovic Cup where he was named in the tournament's All-Star Five while in the following year, he competed against China in the Sino-Australia Challenge and at the World University Games. In 2017, Cadee helped the Boomers win gold at the FIBA Asia Cup, their first appearance at the tournament. After four years with the Sydney Kings in which Cadee came into his own in the NBL, he signed with the Brisbane Bullets for the 2018-19 season. Cadee was one of four players to play the most FIBA World Cup Qualifiers for the Boomers with 10 games, as Cadee averaged 6.2 points and 4.1 assists per game, helping the Boomers qualify atop Group F for the 2019 World Cup in China.